The days since my nephew was born are absolutely flying, which means this pregnancy as of late is absolutely flying! If people ask me how I'm feeling, my response is usually something to the effect of "Oh I'm great! This is the pregnancy sweet spot!". It's so true. Second trimester, I just love you. 1. I had a doctor's appointment this week! My doctor found the heartbeat immediately, and it's going strong at 150 bpm! So funny, he found it on my right side, which is where I always found Taylor's when I would listen with my doppler. When I think about it, I feel this little one wiggle more on my right than I do on my left. I guess my babies just like hanging out on the right side! 2. I was anxious to see what I weighed at the doctor's office this week. As of week 13, I was still at my pre-pregnancy weight. I knew I had gained weight since then, but I had no idea how much. I was up 7 pounds! It makes sense- I feel like I eat everything. I'm hungry all. the. time. All the time. 3. I got back into the swing of things exercise-wise this week and have been power-walking most mornings. It feels so good to get moving! 5. Feeling our baby move is still my favorite thing ever! He moves a lot, and I feel him when I am sitting/standing still. I just love it! 6. We introduced Jenny to my nephew this week, and she was completely apathetic. She noticed us holding a baby but really didn't care. We'll see if she cares more when the baby actually lives with her! The cutest pregnant lady I've ever seen! 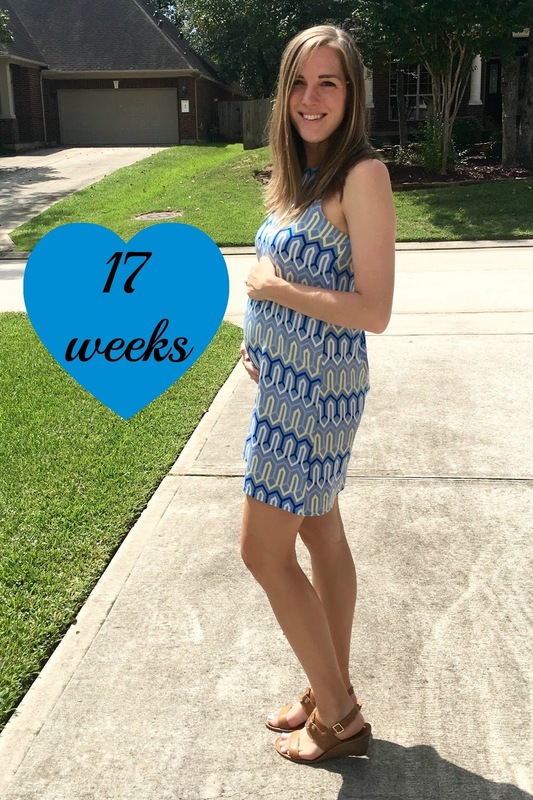 And yes, 2nd trimester is oh so sweet! Eat.All.The.Food! Your bump is so adorable!!! I love it!!! You are too cute! I can't believe how fast time is going by. You look wonderful and hope you are feeling good! I am so excited for you & Parker.